1. Does your family member have any planning done whatsoever? Have they done any planning in writing, such as a professionally drafted Will or Trust? If so, when was the plan last reviewed or updated? Is there a current list of assets? Where should the assets go upon death? Who will be in charge of overseeing these gifts? Should these gifts be administered privately, or by Court Order, as part of a Probate Proceeding? Probate Court is necessary when someone dies with assets that are still titled in their own name. For example, if I am single, and own a home and car, and die tomorrow, those items are still titled in my name. These assets will remain perpetually titled in my name, even after I am gone. Those assets are therefore “stuck” in my name. I cannot transfer them, nor can my “power of attorney” transfer them. Thus, probate is often the only option to get those assets “unstuck” out of the name of the deceased. Probate Court can be avoided, with proper planning. Probate Court may likely cost 5 – 10% of the total probate estate, and usually takes one year, or could take several years in some cases. It is also a public proceeding that anyone can get information on, including creditors and estranged family members. A Last Will and Testament alone DOES NOT avoid probate. This is a common misconception. 3. 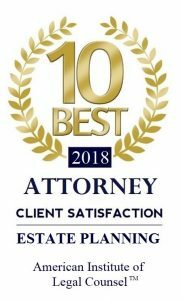 What is a Revocable Living Trust? A Revocable Living Trust is one of the most flexible means of avoiding probate. Setting up a Trust involves determining who you want to be in charge of your assets upon your death or incapacity, and selecting your beneficiaries upon your death, in addition to any other special instructions you may have. Through re-titling your assets into the name of the new Trust you just created, your estate plan avoids probate, and can address special circumstances in your family, such as minor children or deferred inheritances. A Revocable Living Trust will likely save you Thousands of Dollars in the long run, as opposed to letting your assets to go through the Probate Court. 4. Has your family member created a Financial Power of Attorney? A Financial Power of Attorney states, in writing, who will have power to make financial decisions if your loved one is alive, but becomes incapacitated. This is the single most overlooked legal document, period. Simply being married does not give a spouse the right to sign a spouse’s name to financial or legal documents, nor does being a child or family member bestow these rights. This document is extremely important to have done properly. 5. Does your family member have a Health Care Power of Attorney or a Health Care Directive? A Health Care Power of Attorney works just like a financial power of attorney, except it governs health care decisions. This document states “Who” would make health care decisions, if your family member becomes incapacitated. While a Health Care Power of Attorney says “Who” will serve if one becomes incapacitated, a Health Care Directive states “What” will happen in certain circumstances. Essentially, a health care directive asks the question: “If you could have certain treatments that would NOT cure you, but might make you live longer, would you want any such treatments? If so, which ones would you want? I hope that you will talk with your aging family member about these issues. This conversation could save years, thousands of dollars, and a lot of stress and anxiety. Keep in mind, also, that there is a such thing as being “too late”, if a family member becomes incapacitated or passes away. I regularly meet people that have waited too long, until it was too late to do any planning. We offer a free consultation, where we can evaluate your situation, answer your questions, and go over costs before you decide to hire us. We truly do pride ourselves on doing an excellent job, being compassionate and professional, and trying our best to be conscious of our costs. We typically can offer a reasonable flat rate, as opposed to an hourly fee. We also handle other legal matters, such as Asset Protection, Business Law, and Cooperative, Uncontested Divorce, among others.